Summer isn’t over yet! We’re still picking our sweet corn and as long as the weather cooperates we will continue to pick through the end of September. Corn is definitely one of the vegetables that I take for granted because we have it all summer long but I always miss it once the season ends. It freezes really well. We prefer to cut it off the cob and freeze it as kernels only. So what the heck is miso? Fermented soybean paste. Why do we like it? I’m not sure. Why am I using it? Because David Chang told me to. Over the summer Greg and I got REALLY into a new show thanks to our friend, Andrew. The Mind of a Chef. You must watch it. Season 3 premieres tomorrow! These chefs are so awesome and watching them is super inspiring. In fact, season 1 featuring David Chang inspired my gift to Greg for his 30th birthday – a trip to New York City to eat at all of David Chang’s restaurants (and to see a Steelers game). Anyways, this recipe comes from David Chang’s Momofuku cookbook that we of course purchased after watching the show. 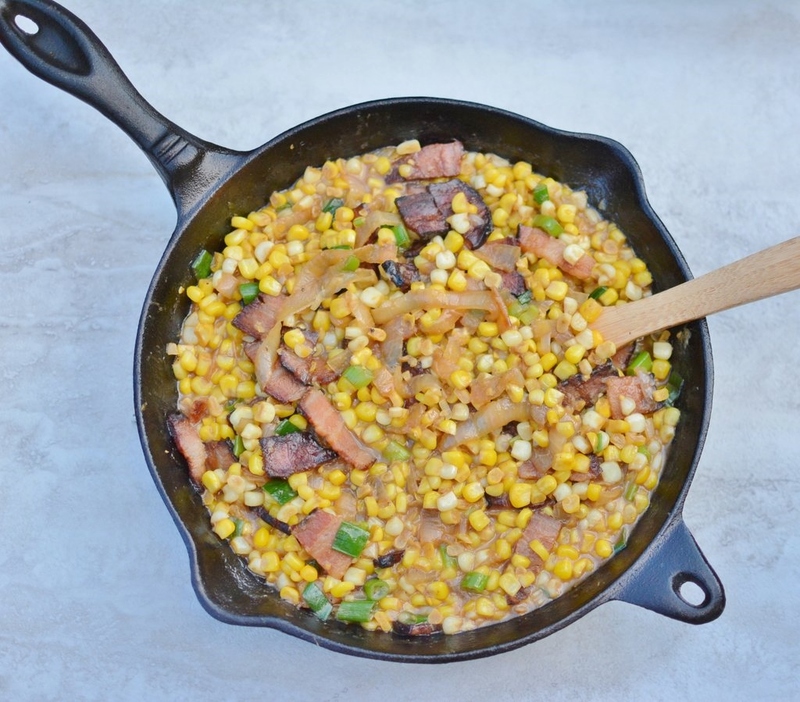 The miso is salty, meaty and nutty and goes perfectly with sweet corn. You’ll find it in the refrigerated Asian foods section of the grocery store, usually near the tofu. 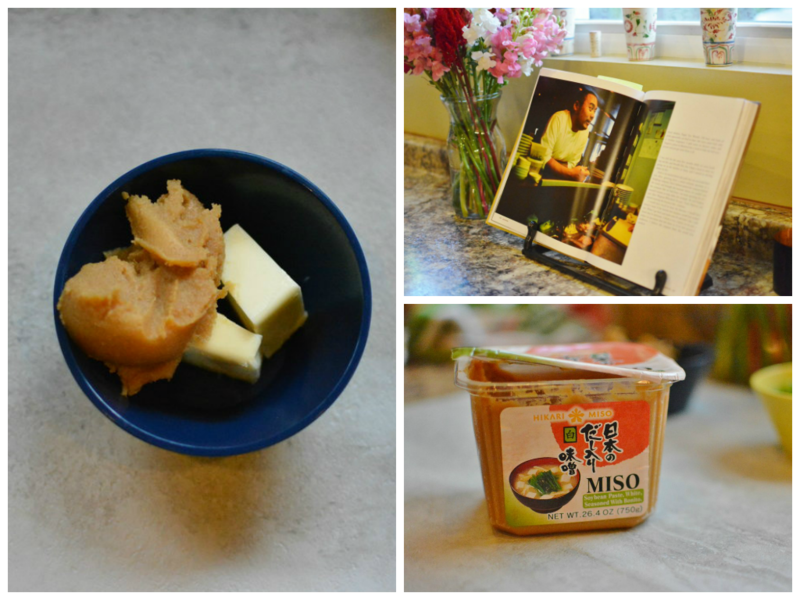 Chang recommends blending the miso with unsalted butter because American miso is too salty. 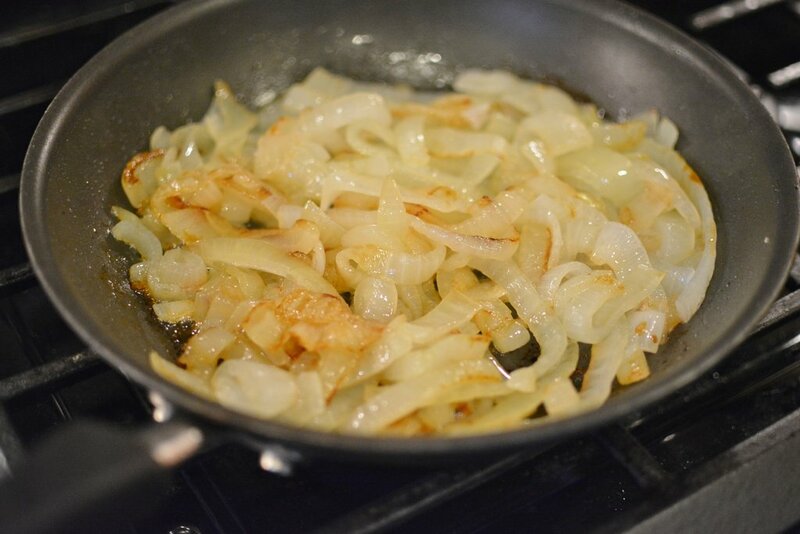 The first step is cooking sliced onion for about 45 minutes until they are just slightly mushy and they have a nice sweetness to them. The onion can be cooked up to a week in advance and stored in the refrigerator. If the onions are prepared in advance, this dish comes together in just about 15 minutes. 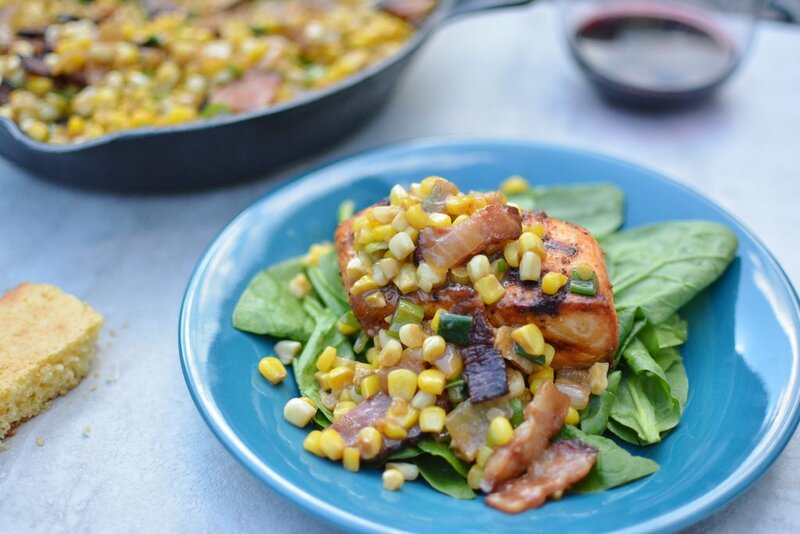 Thick cut bacon is the way to go for this recipe. And for everything else that uses bacon. 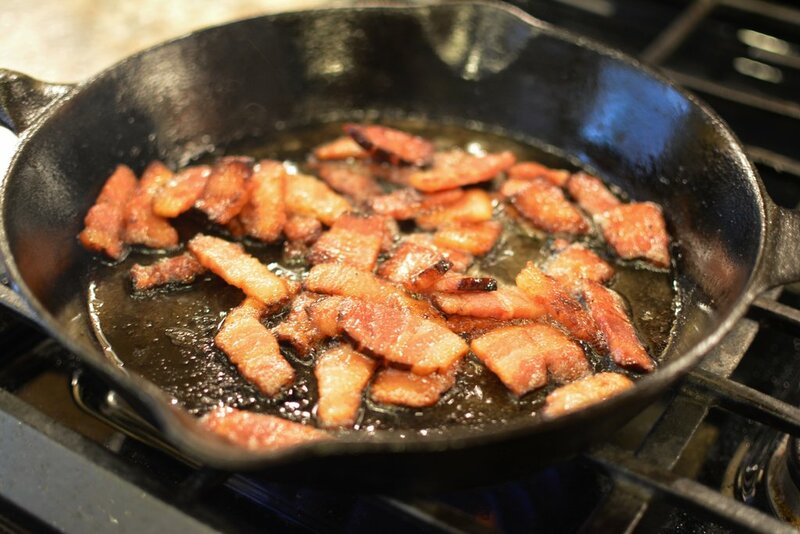 After cooking the bacon, make sure you remove the excess grease from the pan. We want creamy corn, not greasy. 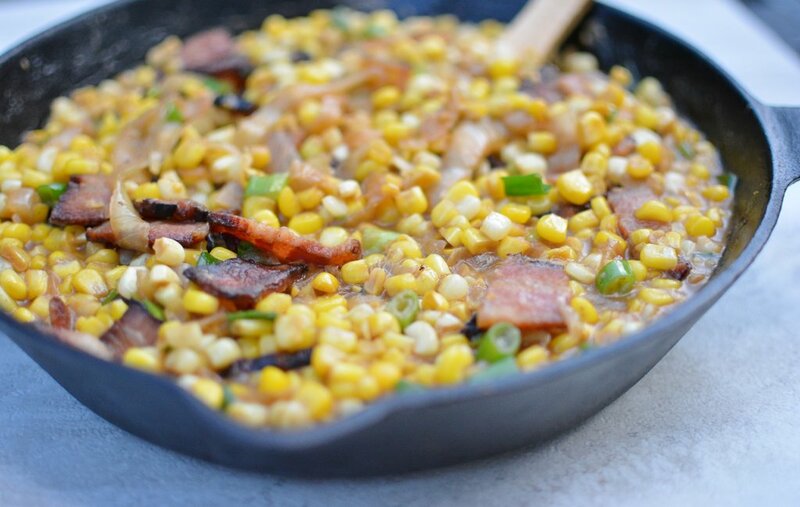 Get the pan nice and hot again before adding the corn. Slow cooked corn will get mushy. 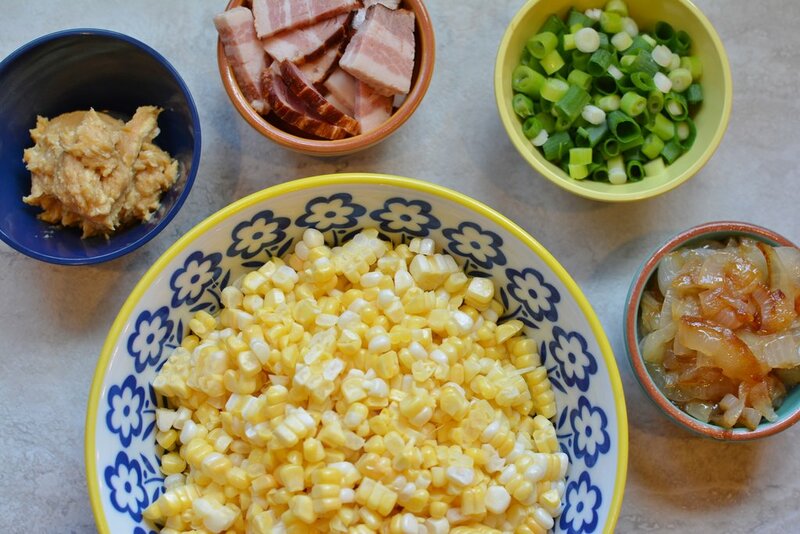 Once the corn is bright yellow, about 3-4 minutes, you’ll just add the rest of the ingredients and cook briefly until the broth thickens. Super simple. Want to take it to the next level? Poach an egg and mix it in for extra creaminess. Heat 1 tablespoon oil in skillet until very hot but not smoking. Add onions and a pinch of salt. Cook, turning occasionally, until slightly browned, about 3 minutes. Lower heat and cover. Cook for about 45 mintues. Combine miso and room temperature butter and stir until well combined. Reserve until needed. Heat 10 inch cast-iron skillet over medium heat until warm. Add the bacon and cook, stirring occasionally, until cooked through and slightly crispy, about 4 minutes. Remove bacon and drain on paper towel. Remove bacon grease from pan. Turn heat to high and add remaining 1 tablespoon oil to pan. Once oil is smoking, add the corn. 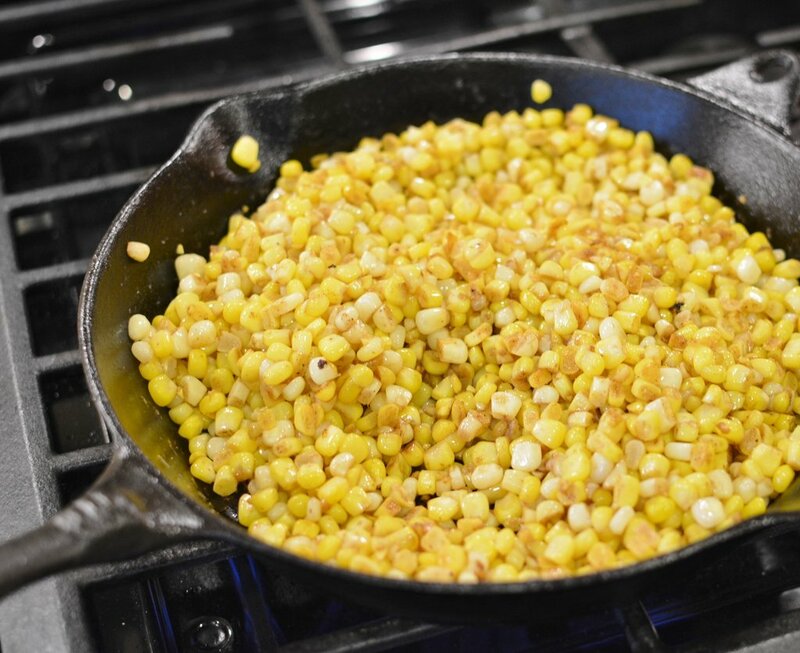 Sauté, stirring, until corn turns bright yellow and some kernels start to brown, about 4 minutes. Add bacon and roasted onion, stir to combine. Add the broth, miso butter mixture, green onions and a pinch each of salt and pepper. Stir until the broth no longer pools in the bottom of the pan, about 2 minutes. Serve hot. The most amazing way to eat corn!